Wedding is most certainly the most important event in anyone’s life. There is a great desire in every person’s heart that this day unravels in the most perfect of manners. There are different settings in which a marriage ceremony can take place. 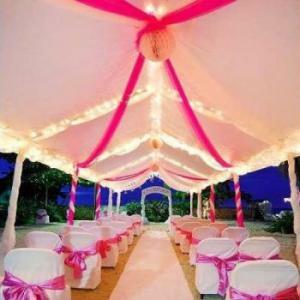 These days, it is preferred that a wedding takes place in open, underneath canopies or tents. Renting the right tents is an important task. One has to make sure that it is done in a proper manner so that there are no issues on the big day for the bride and groom. You will need to have the dimensions of the garden in which the marriage is taking place and the area is to be covered. This will let you know exactly the size of the tent or tents that you will need in order to cover the designated area. This is important that you know about the weather conditions. In case you are getting married in a generally dry season, there is no real need of getting waterproof tents. However, if there is a chance of rain in the given dates or the area supports a surprise shower every now and again, it is best that you get waterproof tents. This can save you a lot of hassle on the big day. There will be many options that will be available to you in the market so make sure that you choose one that offers a great value. You do not want to engage someone who will not deliver on time or what he or she has promised. You can also look online for options so that you have a greater number of options. This may actually help you in saving some money as well. Keep your budget in mind all the way through. This is important since you will need to manage the whole event within your means. There will be canopies good enough to fit in a royal marriage but whether they fit in your budget or not is a totally another story. So make sure that you do not over shoot your budget as it can hurt you pocket big time.